Mokume gane, the ancient Japanese art of layering and fusing metals for intricate patterns, is rapidly becoming more popular for unique engagement rings. LoveToKnow Engagement Rings was privileged to speak with Peggie Robinson, a jewelry designer and goldsmith in Illinois who has been designing mokume jewelry since 2001, about this unusual technique and its application for engagement rings. LoveToKnow (LTK): Which metals do you use for mokume rings, and which are most popular? Peggie Robinson (PR): I use several combinations of metals. By far the most popular is the white on white combination of 18 karat palladium white gold and platinum enhanced silver. I would say the at least 1/2 of all my rings I sell are this combination. The next most popular combination is the tricolor of 18 karat yellow, 14k palladium white and 14 karat rose gold and tricolor with silver. The next most popular combination is 18 karat yellow, 18 karat green and platinum enhanced silver. I have also used 18 karat yellow and 14 karat palladium gold; 18 karat yellow and 14 karat red. 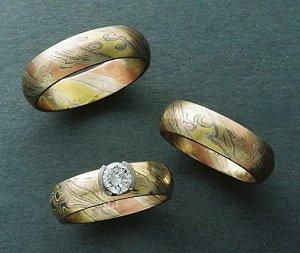 LTK: What percentage of your mokume gane rings incorporate diamonds or gemstones? PR: The percentage of mokume rings incorporating diamonds and other gemstones is approximately one out of four. These are often small scatter set diamonds, channel set diamonds or solitaire diamonds, which I usually set in half or full bezels. LTK: How long does it take to fashion a customized mokume gane ring? PR: From start (making the billet) to finish (the finished ring) takes three days. In that time I will have enough ring stock to make several rings: 2-15 depending upon the size of the billet. From the already fused and worked billet it takes me usually a full day to work the metal into ring stock, and then just a few hours to make the finished ring. LTK: What is the price range for mokume gane rings? PR: Mokume rings usually start around $900 for a narrow ring going up to $2,200 [or more] for a wide all 18 karat ring. If the ring has all gold with no silver it is usually more costly than one with silver, however the platinum-enhanced silver costs 6 times the cost of regular sterling so the cost for a ring with silver in it isn't much lower. Another thing that affects the cost is pattern. The large star pattern that I do is much more difficult to do in rings that are 7-8mm wide so I typically charge about 13-15 percent more for those rings. LTK: Is there any special care needed for a mokume ring? PR: Mokume rings are small works of art so taking them off when doing especially rough work is a good idea. The matte finish can be kept looking great by using a well worn green Scotch brite pad and brushing it lightly with the grain of the ring. Another thing that will happen occasionally is if a ring containing silver is soaked in bleach the silver will turn black or dark grey thus hiding the pattern. If this happens, using the Scotch brite pad will restore the silver color. Plain and channel set diamond bands. LTK: Do more men or women choose mokume gane rings? PR: Men more often buy mokume rings, as men are really fascinated by the process. 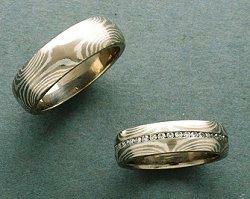 Many men who wouldn't wear a wedding ring will wear a mokume ring because they love the process. Also they can buy a very different ring that is more subtle yet very different. We offer and often make matched sets. LTK: How has the popularity of mokume gane rings grown? PR: I have been selling mokume since the late 1990s and the number of rings sold continues to grow each year. In 2005 I decided to retire from retail after running my store for 30 years to concentrate on mokume. Now at least 1/2 half of my appointments are for mokume jewelry. Peggie Robinson has been designing custom jewelry for more than 30 years, and her collections include gold and platinum pieces in addition to her extensive line of mokume gane pieces. Peggie presented her first mokume collection in August 2001, and began designing mokume gane rings in early 2003. Before designing her own jewelry, Peggie studied the technique and sold other artists' collections, but the popularity skyrocketed and she soon began creating her own exclusive mokume gane pieces. She shares her passion for working with this unusual technique: "I think the most rewarding aspect is trying different color pallets and seeing the different results. It is like painting with very expensive paint. I still get a thrill upon completing a piece whether it is a ring or a pendant or earrings." 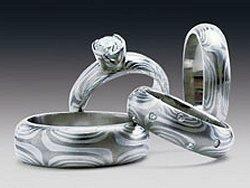 For more information about Peggie's mokume gane designs, visit www.peggierobinsondesigns.com or call (847) 745-2121.